The gardens are continuous changed and updated yearly, for the many returning guests and new visitors. The owners are also dedicated to research and education. Herein is the world's largest palm collection and the most varied collection of orchids in Thailand. The owners exhibit every year at the Chelsea flower show in the UK, where they have often won prizes. 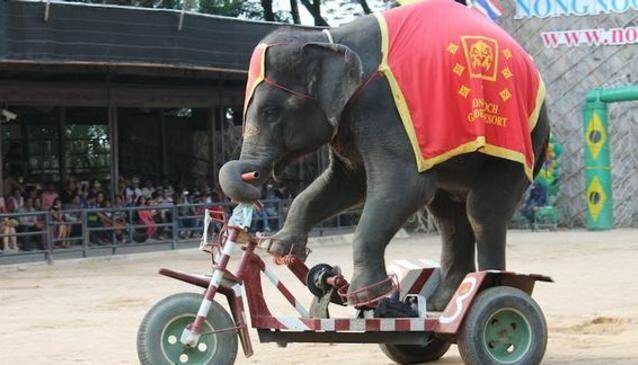 Nong Nooch also boasts the best Elephant show in Thailand. After enjoying the cultural show where Thai War Elephants destroy the invading Burmese, you can sit comfortably and watch the show in the outdoor arena, which feature Elephants on bikes, playing football and painting. The audience are invited to participate by feeding the animals as well as being lifted by their trunks. Elephant rides around the park are also available just outside the show and cafe area. When our team visited they were also able to see a locally bred bay elephant playing with his keeper. Visitors are invited to spend the weekend at the Lakeside Resort.All are also encouraged to see how well the animals (Elephants) are cared for; and the breeding program.